10:18pm ET: Hicks was removed as a precaution and will go for an MRI tomorrow. “Hopefully it’s not something that keeps him down too long,” said Aaron Boone. 8:56pm ET: Sigh. Another injury. 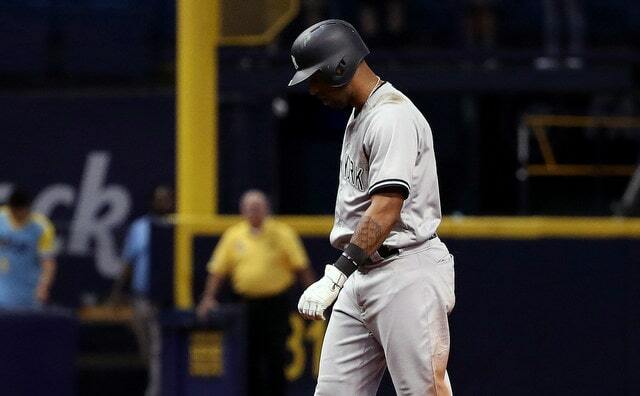 Aaron Hicks left tonight’s game with a tight left hamstring, the Yankees say. Hicks beat out a double play ball in the third inning and appeared to be walking gingerly afterward, though he stayed in to play the field one more inning before exiting. Hopefully this is just a precaution. The Yankees are already without Didi Gregorius, who has torn cartilage in his wrist, and now they might be without Hicks. That’s their two best left-handed hitters (Hicks is a switch-hitter, but you know what I mean) and two key up-the-middle players. There’s not much regular season remaining. If Hicks needs a few days to get healthy, we might not see him again until the postseason. For what it’s worth, Hicks had tightness and cramping in his left hamstring back in July, and missed only two games. With any luck that will be the case again here. Kinda weird that, two days after clinching a postseason spot, the Yankees have lost the player who scored the winning run (Gregorius) and the player who had the walk-off hit (Hicks) in the clincher. Spooky. Brett Gardner took over in center field after Hicks exited the game and he’s the obvious replacement going forward. I don’t think the Yankees want to put Andrew McCutchen in center field in anything other than an emergency. Aaron Judge might be the backup center fielder for the time being.